What categories of wells vent a lot vs what they produce? Although venting volumes have been declining since 2013, it’s worth noting that they begin declining before production peaks in mid 2014. Methane emissions have fallen a lot faster than production, which is a trend that likely requires more analysis. What stands out, is the daily volume of vented emissions from single well heavy and conventional batteries, which is but a sliver of production on the bottom graph. In other words, the facilities that are going to bear the brunt of the capital cost of addressing emissions will likely be single well batteries (heavy and conventional). Which operators are going to bear the brunt of this liability? We’re going to look at operators that have material emissions in the last four years. You can further refine this analysis with the interactive graphic at the bottom of this page. For the purposes of our analysis, we’ll look at Canadian Natural Resources, Husky, Devon, Gear, and Cardinal. They point to different trends in the industry. If you select the vented volumes in the top graph, the second graph will illustrate the amount of production associated with those emissions. CNRL has largely been reducing emissions in the last 16 years. Interestingly, they’ve managed to double their heavy oil production from 2010 to 2014, all the while with a 60% reduction in methane emissions at that time. In other words, they’ve already significantly reduced the liability that they would bear from the methane regulations. The caveat to this, is that CNRL acquired Devon assets in 2014, which explains some of the increase in 2014. 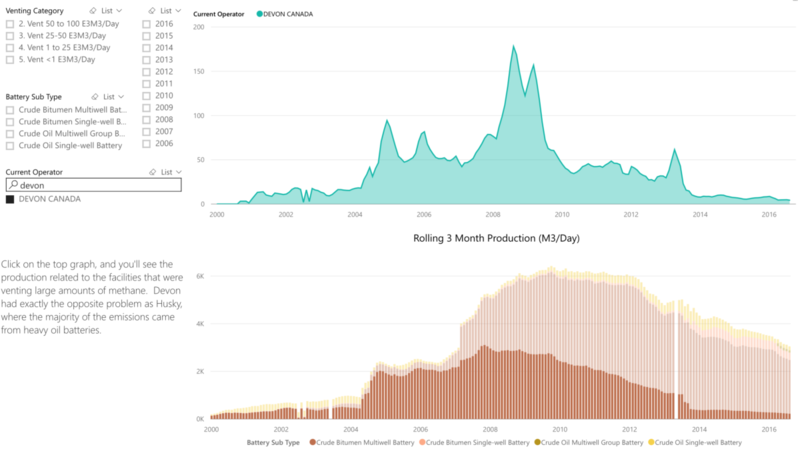 Devon increased doubled their heavy oil production in 2005, and tripled their heavy oil production in 2006 – 2008. They then divested The first production increase had a proportional increase in methane emissions, but the second increase did not. In fact, by 2008, the volumes associated with those emissions were only about half of their heavy oil production. 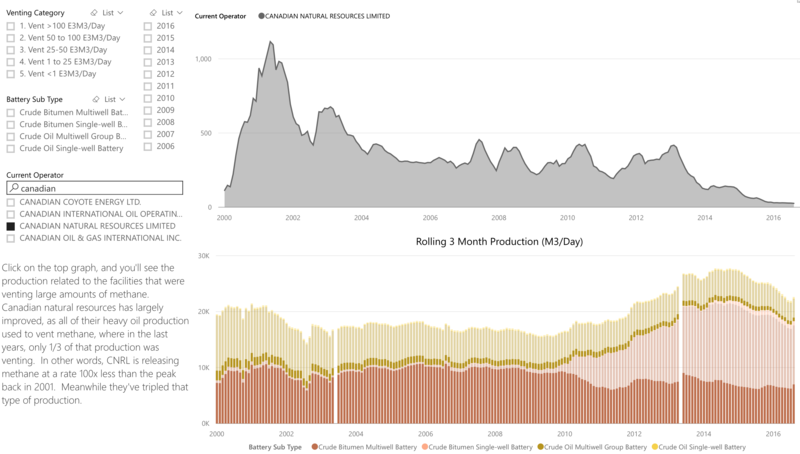 Husky is a large heavy oil producers, and we’d previously shown that most emissions occur from heavy oil assets. The spike in heavy oil production and emissions is interesting, as there was very little volume that accounted for those emissions, while a much greater volume accounted for similar emissions in the early 2000’s. That means that Husky has brought down emissions from Heavy oil assets, but still has substantial emissions in older conventional assets. Cardinal has mostly conventional production within the province, but has a disproportionately high amount of methane emissions. Those emissions occur on nearly 1/3 of Cardinals production, which would suggest that this legislation will have a material impact on Cardinal’s balance sheet. 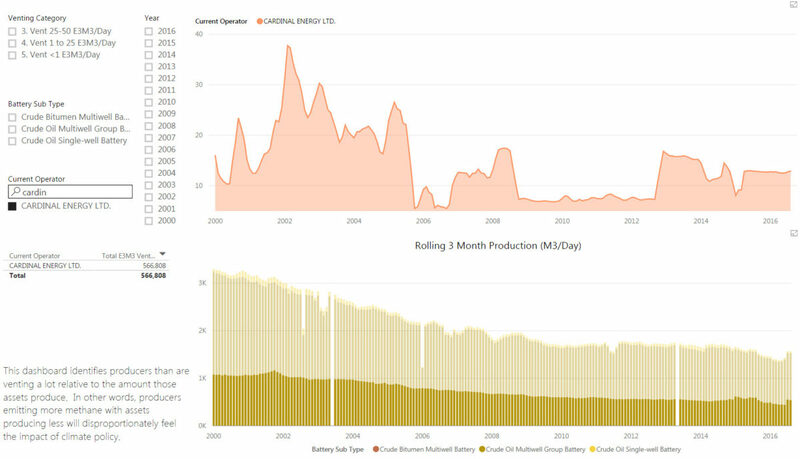 Gear energy is interesting in that they historically has a lot of heavy oil production, which has fallen off in recent years. 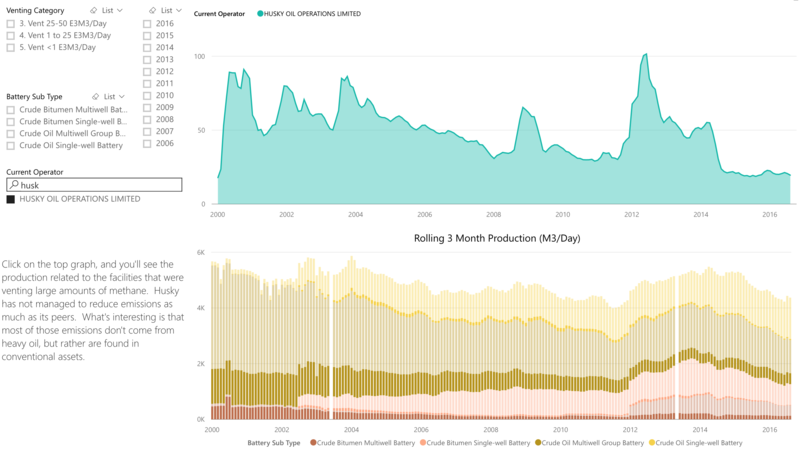 That heavy oil production still accounts for the majority of their emissions, but they’ve recently brought on a lot of conventional production, with next to no emissions. This would suggest that methane emissions will have little effect on gear. 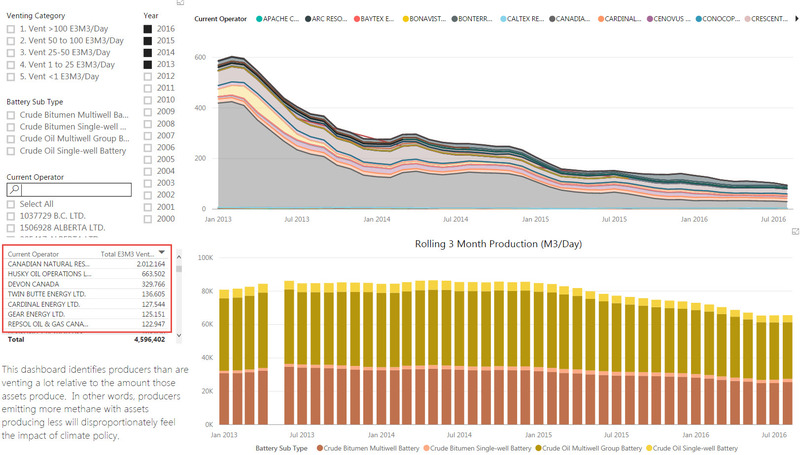 The interactive dashboard below can be used to delve deeper into this analysis. 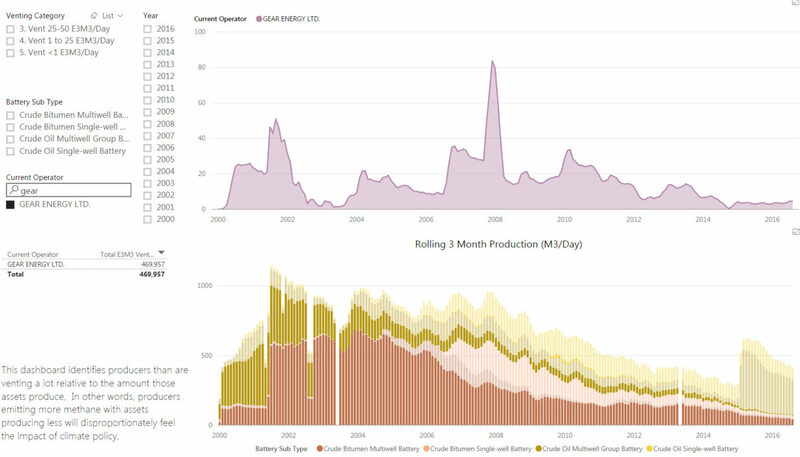 Click on the color in the top graph to see what amount of production was associated with those emissions. Use the filter to pick an operator.